Market Place Car Park01493 846358work Car ParkMarket Place car park is a 148 space short stay car park with 9 spaces for the disabled in Great Yarmouth town centre. Car park not available on market day (Wednesday and Saturdays all year and Fridays from Spring Bank Holiday until mid September). All vehicles must be off the car park by 5pm on the day prior to market days. 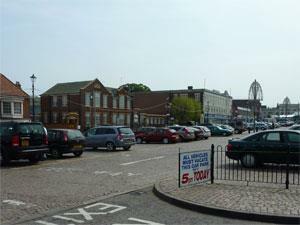 Market Place car park is a 148 space short stay car park with 9 spaces for the disabled in Great Yarmouth town centre. Charges apply in all spaces. Car park not available on market days (Wednesdays & Saturdays year round, plus Fridays during summer season). Drive straight down The Conge, to the market place.